Eddy correlation and micrometeorological measurements began in 2001 and continued through 2005 at the pasture site at km 77 on BR-163 just south of the city of Santarem, Para, Brazil. Measurements included turbulent fluxes (momentum, heat, water vapor, and CO2) using the eddy covariance (EC) approach. Other measurements included the CO2 profile, air temperature, humidity, wind speed profile, downward and upward solar and terrestrial radiation, downward and upward photosynthetically active radiation (PAR), atmospheric pressure, rainfall, soil temperature, soil moisture, and soil heat flux. Data are presented in 5 comma-separated ASCII value (csv) files each corresponding roughly to one calendar year. At the beginning of the measurements, in September 2000, the field was a pasture. In November 2001, the pasture was burned, plowed, and planted in upland (non-irrigated) rice. Land use practices during the study period were recorded and are included in a table in Section 5 of this guide. The EC system was composed of a 3D sonic anemometer (ATI 3D) and an infrared analyzer (LICOR 6262) installed on a 20m tower in the agricultural field. The methodology to calculate the flux is described in detail in Sakai et al. (2004) and a companion file is included that describes in detail the formulae used to calculate the eddy flux variables (CD03_Pasture_Flux_Calculations.pdf). 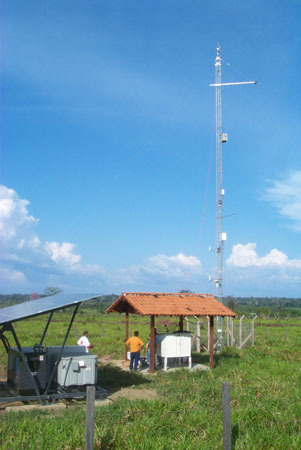 Eddy flux and micrometeorological measurement site, Pasture Site at km 77 on BR-163 just south of the city of Santarem, Para, Brazil. Eddy correlation measurements were recorded between September 2000 and the end of 2005 at the pasture site in Santarem region. The EC system includes a 3D sonic anemometer (ATI 3D) and an infrared analyzer (LICOR 6262) installed on a 20m tower. Other measurements include the air temperature, humidity, and wind speed profile, downward and upward solar and terrestrial radiation, downward and upward PAR, atmospheric pressure, rainfall, soil temperature, soil moisture, and soil heat flux. In addition to soil and atmospheric measurements, a detailed record of the land use at the site is included in section 5. Data were collected at the pasture site located at km 77 on BR-163 just south of the city of Santarem Para. Measurements began in 2001 and continued through 2005. Data are presented in 5 comma-separated ASCII value (csv) files each corresponding roughly to one calendar year. All files have the same format. 2 Julian_day decimal day Julian day or fractional day (e.g., 1.22917) corresponding to the middle of the 30 minute averaging period based on GMT. Local time is GMT - 4. 3 hh decimal hour Decimal hour (e.g., 4.25) corresponding to the middle of the 30 minute averaging period based on GMT. Local time is GMT - 4. 8 wco2 mg CO2/m2/s CO2 flux. Rate of vertical transfer of CO2 calculated from measurements above the canopy. Negative values denote movement of CO2 into the canopy. 12 nee mg CO2/m2/s Net Ecosystem Exchange. Net ecosystem exchange, including subcanopy C02 storage. Subcanopy storage includes the entire column from the ground to the height of the eddy covariance system. 20 Ta_1 degrees C Air temperature at 11.31 m height: Measured using CS500 or HMP45C probes. All probes were enclosed in ventilated radiation shields (MET-ONE, model 076B). 29 press millibars Air pressure measured using a Vaisala pressure sensor (model PTB101B) located in the meterological shed. 37 Fsoil m3/m3 Soil moisture content at 0.29 m depth: Soil moisture content measured with a Campbell Scientific (model CS615). Soil moisture content calibration performed by Pedro Moura/ Humberto da Costa (IAG-USP). 38 precip mm Precipitation data using a tipping bucket model TE525m installed close to the ground. The data set covers the period 2000/09/01 to 2006/01/01. Eddy Covariance technique correlates wind, temperature, and other scalar fluctuations to estimate turbulent flux, based on Reynolds averaging. Sonic wind speed and sonic temperature are based on Doppler effect of the speed of sound. Carbon and water vapor fluxes are based on turbulent fluxes and measurement of gas concentrations by absorption of infrared radiation. Turbulent fluxes were calculated from deviations found using 30-minute centered running means. To account for any sonic misalignment or topographically-induced flow, a 3D wind rotation was applied to the wind component (McMillen, 1988). In the daytime, tubing attenuation due to gas diffusion (Leuning and Moncrieff, 1990) at high frequencies had been observed in the spectra for the variables (CO2 and q) measured by the IRGA. This effect also leads to an underestimate of the turbulent fluxes of CO2 and water vapor. A cospectral correction procedure was used to correct the vertical fluxes (Sakai, 2000). It uses the assumption that scalar cospectra have similar shapes at high frequencies (Wyngaard, 1972; Laubach and McNaughton, 1998; Aubinet et al., 2000; Sakai, 2000). Basically, the normalized cospectrum of the vertical heat flux was used to determine the shape of, and cospectra at, the affected frequencies. At night during stable periods that nonetheless exhibit turbulence, many reported EC measurements do detect the small scale (high frequency) eddies. However, turbulent mixing is often so strongly suppressed at night, especially in open areas surrounded by higher canopy, that the 'stable-continuous' mixing regime is not observed. Low values of the friction velocity were normal at this site. The boundary layer budget method (NBLb), or accumulation method, provides an alternative during these periods. Comparing the tower data with profiles obtained using a tethered balloon during two separate field campaigns validates this method at this site (Acevedo et al., 2004). The gap-filling strategy for daytime fluxes was to use carbon assimilation light curves, following Anthoni et al. (1999). The procedure is divided in two steps. First, we determine an empirical relationship between the carbon flux and the PAR, using the Michaelis-Menten model (e.g., Hollinger et al, 1994). Second, we use the residual value of the fitted curve to perform a linear fit using the vapor pressure deficit as the dependent variable as described in Sakai et al. (2004). An automatic CO2 calibration cycle was performed twice daily for the infrared gas analyzer. Missing values or data that were flagged as unreliable either by an objective algorithm or subjective inspection have been given a value of -9999. Carbon dioxide concentration and standard micrometeorological variables were measured on an instrumented 20 m tower installed in a pasture site that was later converted to rice and soybean cultivation. An eddy correlation system composed of a 3D sonic anemometer (SATI/3K Applied Technologies) and on an infrared gas analyzer (IRGA, Licor 6262) was installed at 8.75 m height at 5 Hz. Air samples from 11.8, 5.3, 2.7, and 0.5m heights were pumped to a second IRGA at 5 Hz and used to estimate canopy storage. Wind components were measured with 2D sonic anemometers (Applied Technologies CATI/2) at three heights 12.2, 5.7 and 3.1m and recorded at 1 Hz. Anemometers were pointed due east since winds from the east predominate. Air temperature and humidity sensors (Vaisala Humitter CS500, or HMP45C) were located in aspirated radiation shields at 6.1, 4.1, and 2.2 m. Near the tower top (17.8 m) data on incident and reflected global solar radiation (Kipp and Zonen, pyranometer CM11/14 or net radiometer CNR1), photosynthetically active radiation (quantum sensors; Licor LI-190) as well as downwelling and upwelling global long-wave pyrgeometer CG2 or net radiometer CNR1) radiative fluxes were collected at 0.2Hz. The table below shows the cropping and land use practice intervals at the km77 site over the study period. Aubinet, M.A., A. Ibrom, U. Rannik et al. 2000. Estimates of the annual net carbon and water exchange of forests: the EURO-FLUX methodology. Advances in Ecological Research 30: 13-175. Sakai, R.K. 2000. Observational study of turbulent exchange between the surface and canopy layer over several forest types. Ph.D. thesis. Department of Earth and Atmospheric Sciences, University at Albany SUNY.